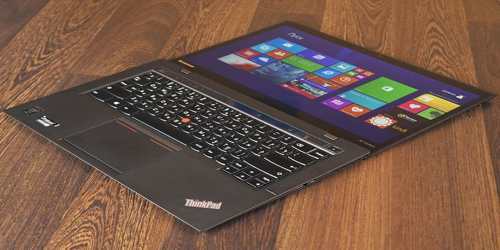 Lenovo’s flagship business ultraportable, the ThinkPad X1 Carbon, has now reached its 5th generation. The new iteration is Lenovo’s thinnest and lightest yet, bearing all the hallmarks that have made the ThinkPad X1 Carbon such a winner in the past. It also shares the characteristic of an eye-watering starting price that will put it out of the reach of many. 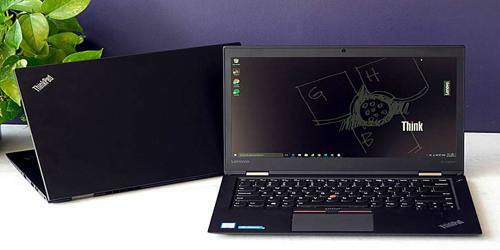 Lenovo’s 2017 ThinkPad X1 Carbon, dubbed its “5th gen” model, recommends itself as the perfect traveler’s laptop with its lightweight body, relatively speedy performance and exceptional 11.8-hour battery life. This notebook manages to fit a 14-inch screen into a sleek chassis that’s just 0.6 inches thin, and weighs only 2.5 pounds. Almost every aspect of this notebook proved to be first-rate in our testing, from its keyboard and touch pad/track point setup, to its IPS display, and even good port selection. It produced some of the best battery life we’ve seen to date, as well. Starting at $1,329, it’s certainly not an inexpensive purchase. The ThinkPad X1 Carbon has an iconic design, starting with the distinctive tough black outer shell (this model is also available in metallic silver). Made from materials that include a carbon fibre reinforced chassis and magnesium alloy roll-cage, this is one tough laptop. 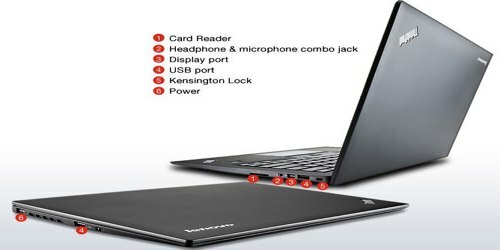 As noted earlier, this is Lenovo’s smallest and lightest ultrabook yet. Its footprint is 10 percent smaller than last year’s version, measuring 323.5mm wide by 217.1mm deep by 15.95mm thick and weighing 1.13kg. By contrast, the 2016 model came in at 333mm by 229mm by 16.4mm and 1.21kg. 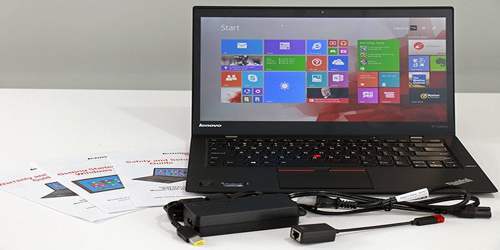 The new ThinkPad X1 Carbon is well-stocked with ports for a notebook this thin. The left edge holds not one, but two USB Type-C ports with Thunderbolt 3. It’s convenient that the power adapter for this notebook can be connected to either port. Users also have a USB Type-A 3.0 port, HDMI video-out, an Ethernet adapter plug on the left side. The Ethernet adapter will be included with production models. Display – The 14-inch screen on our ThinkPad X1 Carbon review model has a resolution of 1920 x 1080. The display is bright, nonreflective and quite readable, with an embedded webcam on the top bezel. The full display brightness is also available in battery operation. The screen is made by AU Optronics and we could not detect any PWM in our measurements. The screen did have some slight problems with clouding, which was visible in the corners. The high contrast (1738:1) in connection with the very low black value (0.16) ensures a vibrant color display. The homogeneous brightness distribution is also very good. Keyboard and Touchpad – The keys have 1.5 millimeters of travel, which is much deeper than those of its direct competitors, such as the MacBook Pro 13-inch, the ZenBook 3 and the XPS 13. Though other ThinkPads typically have closer to 2 mm of travel, the Carbon compensates with a very strong 65 grams of actuation force (60 grams is typical) required to depress the keys, giving the keys excellent feedback. Best of all, the soft-touch deck makes typing extremely comfortable as it gently supports user’s wrists. In typical ThinkPad style, the X1 Carbon features both a TrackPoint pointing stick and a buttonless touchpad for navigation. Performance, Graphics and Others – The Lenovo ThinkPad X1 Carbon is equipped with a modern Kaby Lake CPU. The combination with the very fast SSD results in a very high operational speed without any longer latencies. The Intel Core i5-7200U is the smallest model which is available for this model series. 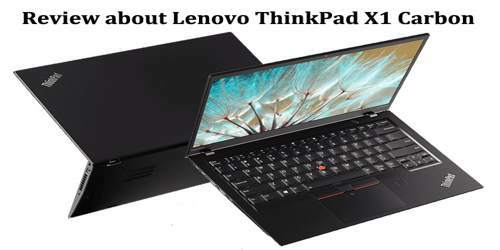 The Lenovo ThinkPad X1 Carbon is available with 8 or 16 GB of LPDDR3 RAM. However, there is no option to combine the Intel Core i5-7200U with the 16 GB of RAM. For that, the considerably more expensive device that can be configured with the Intel Core i5-7300U as the smallest CPU must be selected on the in-house shopping site. The sole choice for a graphics processor in the ThinkPad X1 Carbon is the integrated Intel HD 620 series. This is built directly into the Intel processor. It works well enough for tasks that don’t require demanding 3D performance; gaming and CAD work are generally out of the question. User can use up to dual 4K displays with the ThinkPad X1 Carbon. The integrated graphics certainly aren’t a limitation there. The performance of the integrated graphics unit is limited to older and less-demanding games. Often the performance of the Intel HD Graphics 620 in our test unit is only sufficient for the minimum preset at a very low resolution. Newer games such as The Witcher 3 or Rise of the Tomb Raider completely overtax the graphics unit, so that playable frame rates cannot be achieved even in the lowest graphics settings. This ThinkPad’s two speakers are under the front of the palm rest, projecting downward. They provide just a hint of bass, and overall struggle to sound loud enough. Like most built-in laptop webcams, the X1 Carbon’s 720p sensor captured acceptable, but unimpressive, images. The ThinkPad X1 Carbon ran for seven hours, 16 minutes, which is an exceptional amount of time in this test. In the Lenovo ThinkPad X1 Carbon 2017 (Core i7 model) the clock speed of the CPU even dropped down to 1.8 – 1.9 GHz during the load test. This results in a clear advantage for our test unit with the Intel Core i5-7200U, which could maintain a higher clock speed consistently. In the GPU, there is no such performance drop. Even after an hour of continuous load, it still runs at 950 MHz. 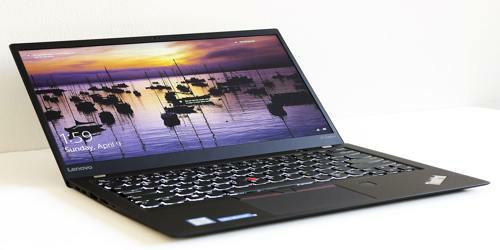 Lenovo’s ThinkPad X1 Carbon continues to impress. Smaller and lighter than last year’s model, it packs in solid components and plenty of ports and connectors – an object lesson for vendors who try to get away with providing the bare minimum. Lenovo has compromised with the screen on two counts: by not offering a touch-screen and by delaying the arrival of the high-resolution quad-HD option.